I promised you a couple weeks ago that in 2010 I would focus on social media integration and real business. Well, I’m starting a little early. Trident has released a new gum called Trident layers, which appears to be some sort of neapolitan ice cream-type multi-flavor concoction. (Personally, I’m okay with my gum tasting like just one thing, but perhaps I’m not hip enough for today’s confectionary trends). 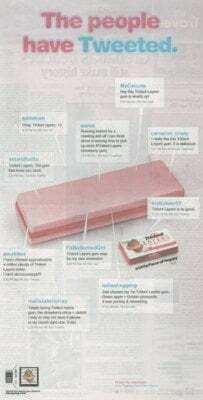 Last Friday (December 18, 2009) Trident ran this full-page ad in USA Today, which was comprised entirely of actual tweets from real, uncompensated fans of the new gum. The brand found the tweets using Twitter search, and approached each person with gum coupons in exchange for featuring their 140-character love notes in the ad. The ad asks readers to visit the brand on Twitter at http://www.twitter.com/tridentlayers. I’m not sure that particular tactic was successful, as the account has just 190 followers (a far cry from USA Today’s 1+ million readership). I might have preferred the call to action be to visit Trident on Facebook, where they have more than 250,000 fans, and are using a nifty coupon app to give you 75 cents off your first pack of the new gum. The ad also includes a QR code in the bottom left (which I snapped with my nifty Microsoft tag reader). Doing so also takes you to the Twitter account. Handy if you’re reading the newspaper without Internet access nearby, and it also provides another tracking mechanism for the brand. (Note: I’ll be writing more about it next year, but marketers really need to get ready for QR codes. It’s going to be BIG and soon). Overall, I love this effort. It’s a great example of taking a traditional tactic and making it social, instead of using social as a separate, magical silo. If you see other examples of social media and print convergence, let me know will ya? Meanwhile, what do you think of this campaign? Innovative, or much ado about nothing? And if you’ve tried this three-layer gum, drop a comment please. I’m curious.